o Do you need more keys for your BMW? o Did you loose your key and want to cancel it? o Did the dealer tell you that your car will need to get new locks, keys, EWS, because you used all 10 keys? o You cannot start your car using the existing key. United Auto Security offers several packages that will help you get more keys, unlock your EWS so that you can add more keys, and save you the hassle and cost. If your BMW is built in 1995-on, your key will most likely have a chip in it. This chip is referred to as a transponder*****. When you put the key in the ignition, this chip will transfer the code through the ring antenna (located around the ignition switch) to the EWS** module. The EWS then confirms the chip and then send the signal to activate the starter and the fuel pump by sending a signal to the DME unit (engine control module). So if the EWS does not get the correct code from the transponder, the car will not start. *****The Transponder (Chip) does not have a battery, it is usually energized by the radio signal sent from the ring antenna. **The EWS (Drive Away Protection) module is programmed in a way that it can only have 10 functioning keys at any one time. This service includes the programming of your BMW EWS module*** for a one time fee*. Step 2: Mail your BMW EWS module as per the email details. Make sure to include your name, address, e-mail address, a copy of your vehicle's Registration or Insurance Card, and order # to facilitate the process. STOP! Make sure to pack your EWS module in a padded envelope or a box to avoid any damages! 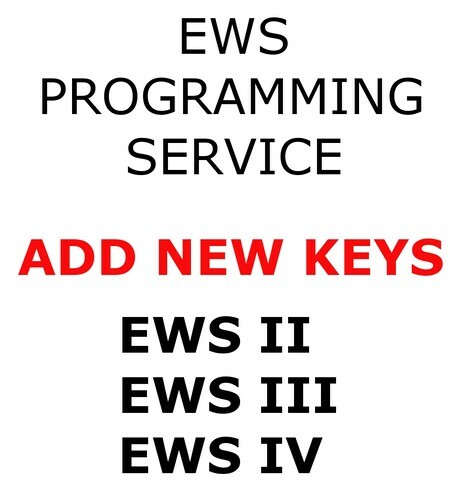 Step 3: We will unlock and program your EWS with as many keys as you need (transponders and keys sold separately). Step 4: We will ship the original EWS and the new key (s) back to you the same day. Overnight Shipping available at checkout if needed. ***If you have purchased a system from United Auto Security, the keys are included. Simply purchase transponders for each key from our website. *For future orders, there will be no need to re-send your EWS module. Key Cutting Service - Simply choose how many new keys you need cut to match your original key. Please note that you will need to send us a high quality picture of your key by email to perform the key cutting service.